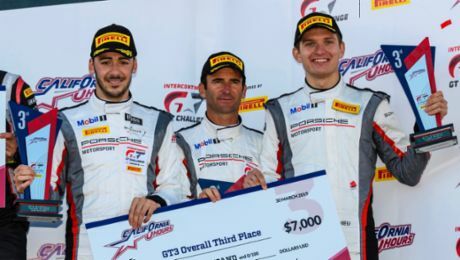 On the ultra-fast racetrack at the Canadian Tire Motorsport Park in Bowmanville/Canada, Earl Bamber (New Zealand) and Frédéric Makowiecki (France) had fought their way up to second place. However, in the final phase of the race they were unable to defend this position against the four other automobile manufacturers in the fiercely contested category. 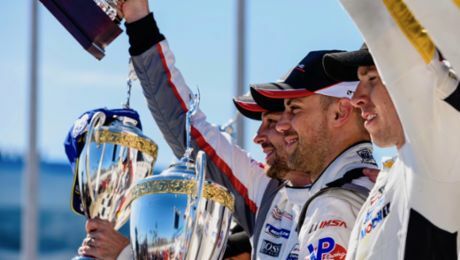 Their teammates Patrick Pilet (France) and Nick Tandy (Great Britain), the winners of the Long Beach race, finished on eighth place. Porsche currently ranks third in the manufacturers’ classification of North America’s premier sports car racing series. The new Porsche 911 GT3 R of Seattle/Alex Job Racing tackled the 2.40-hour race from pole position. The former Porsche junior Alex Riberas (Spain) defended his lead until the first pit stop, and his teammate Mario Farnbacher (Germany) also held the competition at bay for long periods with the 500 hp customer sports racer from Weissach. But with just one hour to the flag, their hopes of a second win after Laguna Seca were dashed when the 911 GT3 R lost a wheel. As the best Porsche customer team, Park Place Motorsports with works driver Jörg Bergmeister (Germany) and Patrick Lindsey (USA) conquered sixth place. Round seven of the IMSA SportsCar Championship will be contested on 23 July at Lime Rock Park in the US state of Connecticut.